When you are considering buying a property, a survey to look for structural problems and issues that could cost money down the line is normal. A growing number of people also have a timber & damp survey carried out to look for signs of woodworm, timber decay or damp. These surveys look for common types of damp and any signs of them that can help you spot a problem, before you commit to buying it. They also check accessible structural timber for decay or woodworm. These items are usually covered in a standard survey, but to be doubly sure that you are aware of these problems before you commit to buying the house or before you try to sell it, having a full timber & damp survey can be the best approach. 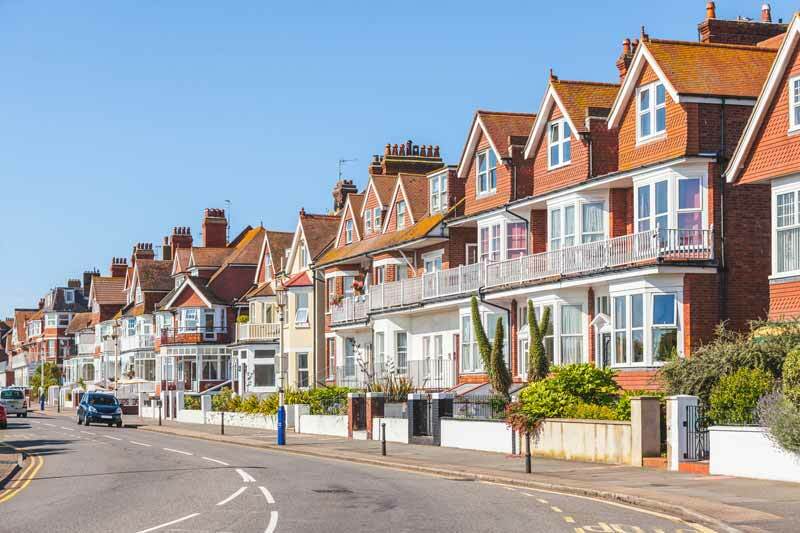 Damp comes in several different forms but there are three that are most commonly seen in properties around the UK – rising damp, penetrating damp and condensation. There is some overlap in the signs of them but the location of these signs help determine, which of the three are the root cause of the problem. There are even more different kinds of timber decay, the most common being woodworm, of which there are many different species and timber rot, such as one of the variety of Wet Rot or the dreaded Dry Rot fungus, all of which can cause major damage to the wood in your property. 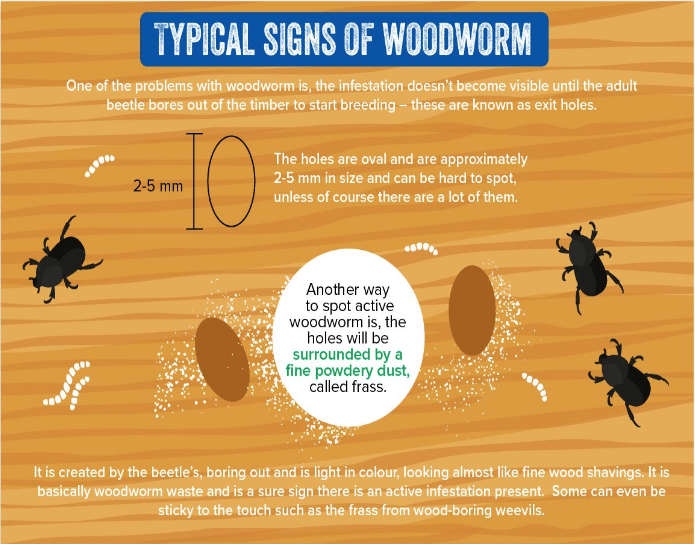 The first signs of woodworm, are small oval holes in wood which are surrounded by a clean fine dust (frass) The most common of these is the Common Furniture Beetle (Anobium punctatum) which can attack all sorts of items, such as timber floors, roof timbers, furniture and external timbers. If left untreated, woodworm can cause progressive structural damage to an extent that floors need to be replaced. Condensation occurs when warm moisture air in the property, comes into contact with a cold surface such as a window, wall or furniture. The moisture is realised and creates droplets on the cold surfaces so water on windows or windowsills can be a sign of a condensation problem. The increase in moisture levels also means that black mould can grow on walls and other surfaces, so you will see horrible black spots. You may also notice peeling paint, plaster or swollen skirting boards due to the high moisture levels. Rising damp is where groundwater rises up through the bricks of your house and into the internal surfaces. Normally, a damp proof course or DPC would act as a barrier to stop this process, but if the DPC is missing or damaged, then the water will continue to be absorbed through the bricks. The increase in moisture levels in the bricks will often lead to peeling wallpaper and degrading of the wall plaster that bubbles and peels away from internal walls. You will often see swollen skirting boards that will also crack and easily break. Tide marks are discolourations on the wall up to 1.5 metres high where water has been and has evaporated. Rain penetration happens when there is a weakness in the maintenance of the property that allows rain in, often around the roof or higher areas of the property. Broken roof tiles, cracks in the render, weak mortar joints (pointing) or damaged roof tiles are all common culprits for allowing penetrating damp to access the property. Sometimes the signs can be similar to rising damp but often will appear near the ceiling or in the loft of the house near where the cause is. 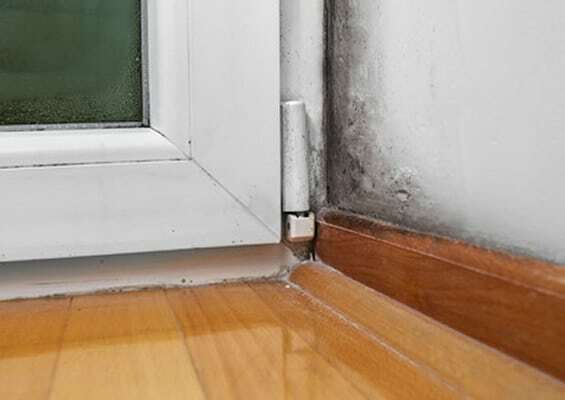 Mould will also grow on areas of walls or ceilings that are wetter than they should be and timbers in the roof can be stained or decayed by the high moisture levels. You may also see watermarks on the masonry outside the house. There are secondary problems that come with damp, that you should watch out for as these can be even more serious than the damp itself. The most common of these is Wet Rot (Coniophora puteana) and the dreaded Dry Rot (Serpula lacrymans). Both are types of fungus that grow when there are certain moisture levels in a property and can be devastating in the damage they cause to the structure of the house. By far dry rot is the most insidious and should be dealt with, without delay. 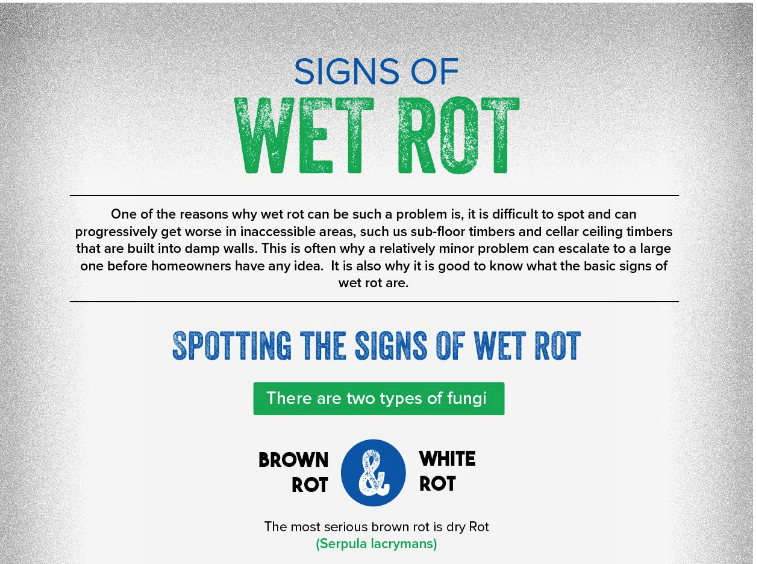 Wet rot needs the highest levels of moisture of the two problems to thrive and is usually found in dark areas with little ventilation such as under floor voids or a basement or cellar. Wood that has wet rot cracks, both horizontally and cuboidal, depending on the degree of decay. You may also notice a springy feeling to the floors when you walk on them, which is an indication that there is a breakdown of the structure of the wood. You may also notice a damp, musty smell that we all recognise as associated with the problem. See here for more info. Dry rot without doubt is the most insidious of any decay a property can have. It needs lower moisture levels to thrive (around 22%) and can spread through the structural elements of the property, searching for its food source, wood, causing massive damage if left unchecked. It makes wood weak and brittle, affecting the strength of the house and often can be harder to spot, hence a specialist timber & damp survey being imperative. Signs can include brittle, split and warped wood with cuboidal cracks as well as a damp, mushroom smell. You may also see the fruiting bodies of the fungus, which are fleshy rust red pancake type mushrooms and notice rust red dust on surfaces, which are the spores. Woodworm can also be associated with damp problems because these beetles (there are several special) prefer certain moisture levels in order to breed. So if you don’t have a damp problem, you are much less likely to have a woodworm problem. The beetles lay eggs on wood and the larvae then hatch and chew through the wood – this is what they eat. This leaves behind the boreholes that are a recognisable sign of the problem. You may even see adult beetles. See infographic here. If you are looking to sell or buy a property with a timber or damp problem, it is important to learn the extent and what needs to be done to fix it before you commit to the sale. 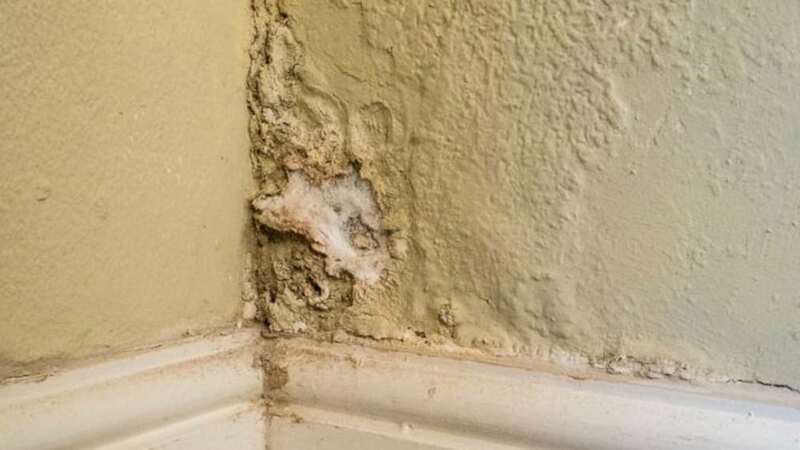 Some problems, like dry rot, can be expensive and time consuming to deal with while even simple rising damp can mean a new damp proof course and replastering is required. So an expert survey before you commit protects you and helps you make an informed decision.